A musical biography of wartime singer Jane Froman, With A Song In My Heart sprinkles a little bit of story with a whole lot of songs. 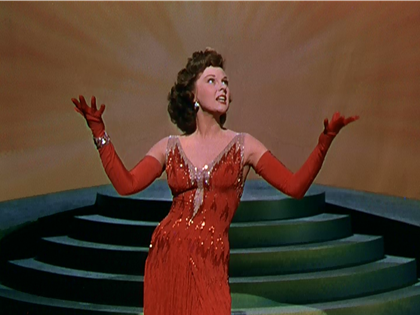 Susan Hayward in the lead role and Froman's actual singing voice ensure a reasonable level of enjoyment. 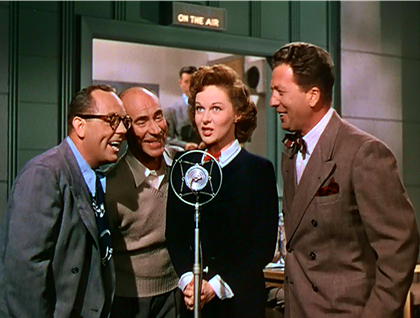 In the late 1930s, unknown singer Jane Froman (Hayward) is discovered by small-time music writer Don Ross (David Wayne) when he helps her to prepare for a radio audition. With assistance from Ross, Froman's career takes off, and she is soon propelled to the front ranks of stage performers and recording artists. After a lot of prodding, she agrees to marry Ross. But his songwriting career is going nowhere, and the inevitable jealousies creep into the relationship. With World War Two raging, Froman heads out on a tour to entertain the troops. Tragedy strikes when her plane crashes off the coast of Lisbon, with many of the passengers losing their life. Froman survives, but one of her legs is severely damaged. During a long recovery phase, Froman falls in love with Captain John Burn (Rory Calhoun), a fellow survivor of the crash. She also establishes a deep friendship with nurse Clancy (Thelma Ritter). Once she recovers sufficiently, and despite her mobility challenges, Froman heads back out on a triumphant tour to raise the morale of America's fighting men. A solid two thirds of With A Song In My Heart is occupied with performances of Froman's songs. In various settings, the radiant Hayward is excellent at emoting, and Froman's deep and distinctive voice shines. The film carries around 17 songs, not counting another 10 that feature in a climactic medley celebrating the good old U.S. of A. For fans of Froman's voice and music, the film delivers. As a dramatic experience, the remaining 40 minutes or so of narrative development are adequate at recounting the story of Froman's rise from obscurity to stardom, the struggle to overcome debilitating injuries, and her comeback as a performer who uniquely understood the scars of men wounded in the line of duty. The film is narrated by Wayne, Calhoun and Ritter, and therein lies its nagging weakness: this is Froman as superficially seen through the eyes of others, and director Walter Lang, working from a script by Lamar Trotti, never comes close to delving into her essence. The film offers nothing about Froman's background, motivation, values, or inner thoughts. Wayne and Calhoun provide relatively low-key support as the two men in Froman's life, while Ritter offers some of the film's best moments, and crackles as the nurse who became a key friend and companion. Both Ritter and Hayward earned Academy Award nominations. Robert Wagner has a small but memorable role as a paratrooper entertained by Froman first in the United States, and then under very different circumstances in Europe. With A Song In My Heart is first a celebration of music and then a sketched story of a life. More a concert show than a drama, it nevertheless soldiers on, powered by the fuel of good intentions.